LAS CRUCES, N.M. – The New Mexico State Athletics Department released the 2014 New Mexico State football poster, Thursday afternoon. This year the 2014 edition is shaped like the state of New Mexico, while also holding several elements of symbolism. In addition to its unique shape, die cut in the State of New Mexico, the player wearing the No. 1 jersey shows that the players are excited for a new season and ready to strive for success on the field. It also symbolizes unity among the community, coaches, players, and the university to rebuild the football program to prominence. The wording ‘This is our State’ ties into the die cut of the poster as well as a commitment to recruit New Mexico student-athletes and distribute television and radio events to as vast of a state-wide audience as possible. The lights shining down on the player represents a bright, new era of Aggie Football as it enters the Sun Belt Conference. These posters will be available to the public sometime after June 11th and can be picked up at the Pan American Center ticket office, the Stan Fulton Center or at select locations around Las Cruces. Season tickets start at just $50 and are on sale now. 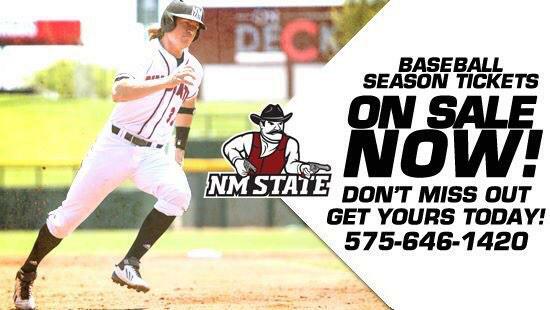 Fans can order tickets by calling the Pan Am Ticket Office at (575) 646-1420.